In addition to my normal videogame consumption, for the first time, I am facilitating a tabletop RPG. Being new at game and story creation, I am fearful of making mistakes, cautiously developing a cohesive and welcoming story environment. This has me thinking about character development and what it takes for players to feel comfortable in an alternate persona. Fortunately, this process has been coinciding with my Fallout 3 experience. Fallout 3 seems to welcome players into a world of nearly endless possibilities. 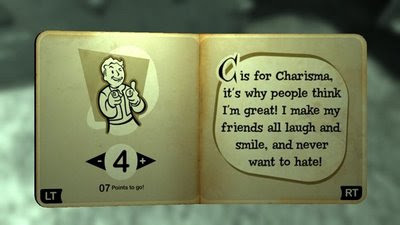 The previous games in the series allow players to do almost anything they want, and Bethesda has put in a good effort in maintaining this trait. Endless options, the game suggests, give players a deeper connection with the avatar they develop. The outcome, theoretically, is a role playing game in which the player feels at home in the body of a Vault 101 resident, immersing the player not just in the game but in their persona. There are some important character creation tools at a DM’s disposal. Players commonly choose play styles before the game begins. They often have character goals in mind before their persona even has a name. Players may also choose a character alignment (Chaotic Neutral, Lawful Good, etc.) to map out how their avatar may behave in certain situations. DMs will frequently supplement these decisions with a personal history for the player. Not only does the history provide a brief overview of knowledge, but it provides an experience the player can interpret to develop their avatar’s long-term motivations before in-game events transpire. My Fallout 3 character was created in a similar way. I chose to play “evil”, deciding to blow up megaton as soon as I knew it was an option. But I also wanted to see how complex of a character I could develop, deciding I would contextualize and justify my actions. As a baby, I needed to assign ability points, divorcing these decisions from my character's motivations. I had no personal history to shape these decisions. I did not invest points into intelligence because my character had a history in the public education system, but because of its mechanical relevance later in the game. This is similar to character creation in tabletop gaming, but without an established personal history or knowledge of the world around me, I could not easily contextualize these early decisions. 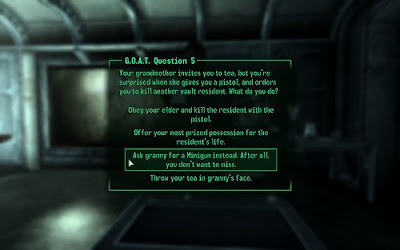 Fallout 3 quickly gives the player dialogue choices that color who the character is, rather than a giving the player a sense of who their character is beforehand. Why was I behaving like a little Vault punk, other than the fact it was in line with how future me might behave? An early example of contextually removed choices is the G.O.A.T. exam, a silly test clearly designed for the players benefit, not the avatar’s. The answer to these questions have no in-game effect. The results of the exam determine which skill points the game suggests you tag, not binding you whatsoever to the outcome. Any motivation for choosing one option over another comes from the player alone. Despite these barriers, I had fleshed out my character to my liking and came out of the vault comfortable with my decisions. My evil actions would be driven by mistrust, paranoia and a desire to find my father. Yet the game design did not facilitate this interpretation. I stole to survive, yet for every Stimpak I would steal, I would lose Karma points. At one point, my negative karma allowed one "shady" gentleman to view my character as a potential compatriot, despite the fact he had never seen me steal or kill. The personality I gave my character was not the personality Fallout seemed to be shepherding me towards. My character’s desire to find her father also collided with quest decisions. I rarely felt justified setting aside the main quest line to accomplish any of the many side-quests available. Even loathsome acts are committed for the benefit of NPCs I would not normally interact with. When I did finally find my father, my character's story arc was essentially complete, making the rest of the game moot. At this point my character’s motivations have changed dramatically and I am having an easier time contextualizing my actions. Yet the difference between role playing in a open world tabletop environment and role playing in the confines of an open world videogame are still stark. A role must be created before it can be filled, something endless choices do not facilitate. Despite having significantly less depth than Fallout 3, I found is much easier to play the role of a comically evil villain in Fable II. Options may not facilitate role playing, but this might not be a bad thing. Character creation and development is an exciting prospect for many players. What this implies however, is that this entire experience could be my fault. Maybe I was playing it wrong. If a game is created in which player interpretation and choice are fundamental to story progression, could the player be to blame when the game does not live up to its narrative potential? Well, one of the problems was that the game wasn't really affected by your "choices". Nothing had any major impact. And the endings didn't really reflect anything other than two choices; whether you were 'good' or 'evil' and whether you died at the end or didn't. The original Fallouts actually had various endings to each city you visited, and the impact of choices was a bit more, well, impacting. They pretty much made this a shooter with some RPG elements, nothing like a table-top game, though a little more in-depth than BioShock. Neverwinter Nights is closer to a table-top game. I am in complete agreement with you Tenth. I have heard a great deal about the originial Fallout games, and I intend to give them a try. From what I hear, they are significantly more interconnected with their tabletop influences. Neverwinter Nights is a perfect example of a digital tabletop gaming, but I can't help but wonder if that is too much for people now, particularly for console users. Adventure creation is some pretty heavy stuff. I am keeping a diary of my FO3 character's adventures and in doing so also attempted to 'get into' my character's head to make the entries more interesting. I have also found myself questioning a lot of the actions and decisions you're expected to make. I'll try to avoid too many explicit spoilers here (I haven't finished the game myself yet as I'm so deliberately taking my time - not even fast travelling) but can't promise it all. My character has become incredibly disillusioned with her father's quest and now resents how his flip-flopping has resulted in her being cast out of the Vault. The brief return the Vault just hammered this home for me. She (and I) are also not really seeing eye to eye with the game on how the Brotherhood are the good guys and that the Enclave are evil. The Brotherhood, after all, are a splinter faction here who are only protecting the locals because their leader is a 'nice guy'. Otherwise, they'd hide in their fortress behind their wall of guns and let things take their course. The Enclave, meanwhile, represent to me law and order, established government, and civilization. All of these are desperately needed by the people of the wastes, who live in fear of slavers, mutants and raiders. Indeed, every encounter I've had with Enclave patrols has seen them killing evil characters like raiders and re-establishing the US Government's authority. Perhaps the ending will give some incredible revelation that I'm wrong and stupid to be thinking this (and I've finished both the original games so I know what they're all about) but at the moment my 'good' character finds herself much more inclined towards them. I'm hoping that the final DLC caters to something other than blindly supporting the Brotherhood. I love the fact I am not the only one who fleshes out a character's history more than usual! I was starting to think I was crazy. But really, the game is asking for it. I can definitely see your situation as troublesome. At this point my character fits pretty well into the Brotherhood of Steel plot. Our different perspectives makes me think this outcome is unavoidable in open-world role-playing games. Jorge, the game is indeed asking for better characterization than it currently has. Ever since Mass Effect and its astonishing conversation system, every other RPG (Oblivion in particular) has looked shoddy and unfinished. Character interaction in Mass Effect feels like a proper conversation, whereas in Fallout 3 it's just picking a 'nice', 'nasty' or 'goodbye' chat option in far too many cases. Granted, no game will ever let you ask all the questions you'd like to of an NPC, but I feel far too restricted by the choices here as they're all tailored to ensure my character says the right things to advance the plot. Without fleshing my character out, I wouldn't have enjoyed the game nearly as much. You mentioned your character was having to do horrible tasks for NPCs they wouldn't normally associate with. I suppose my character, as she's essentially a good person (but like all PCs has kleptomania) is doing all the subquests to try and help people as she wants to use all the advantages she has to improve their lot (I suppose some guilt about a privileged upbringing in a Vault is involved). I can't really see how that is going to work when I attemtpt an evil playthrough - I struggle morally as it is playing evil characters. Good in a game means both killing monsters and doing good deeds, whereas being evil just means being a thug as opposed to calculating. I am unsure how an evil character would deal with much of the main plot given the amount of rescues involved - surely if they're properly evil they just wouldn't bother in the first place? But again, as you've said, in spite of one's best efforts to shape a character in Fallout you just get railroaded towards a certain conclusion. Anyway, I've prattled on for long enough. Thanks for provoking my thoughts! If you want to read my character's diary (more is written than I've posted) you can find it on my Deadjournal in my profile. Cheers! Okay, so I’m a few years late…. But I’ll throw my 10c in there. I think that perhaps folk disappointed with playing evil are maybe just not roleplaying enough. My most fulfilling RPG experiences in Fallout 3 have been playthrough where I didn’t actually play through, and if you want a truly unique role-play experience you can’t just follow a pre-scripted plot. In my evil game, I got my apartment in Tenpenny Tower and then spent the rest of my time hijacking caravans and raiding villages. Rivet City got to stay (it was a too heavily guarded and provided useful supplies) and Tenpenny Tower was safe (never crap in your own front yard). I avoid quests (unless there was a tempting reward on offer), I horded supplies, collected rare equipment to decorate the apartment and became an undisputed king of the wastes. So, what is my point? The roleplaying in Fallout 3 is as deep as you want it to be. The game’s world is a wonderful backdrop for adventures fueled by your own imagination… but if you want to roleplay don’t be content to follow the pre-scripted plots.